Fresh off the release of his new book, Super Rich, hip-hop mogul and entrepreneur Russell Simmons shares the secrets of his success. Your new book, Super Rich, is a followup to your bestseller, Do You!. What was Do You! about, and why do you think it was such a success? Do You! was a success because it gave a lot of people the confidence that they could turn their lives around. From junkies to socialites, I had a lot of people tell me that Do You! gave them a kickstart to change their lives for the better. A lot of people are going to hear the title to your new book, Super Rich, and think it’s about the “bling bling” ethos now prevalent in hip-hop. How wrong are they? They’re not entirely wrong, because the road to enlightenment is paved with gold. But despite what the title suggests, this book isn’t about just getting paid. This book is about becoming a conscious, connected, compassionate, and ultimately enlightened person. And people like that happen to be very attractive to the world. In Super Rich you write about how you embraced yoga—both the spiritual and physical aspects—about 15 years ago. How did you get into it, and how has it changed your life? Do you think everyone would benefit from yoga, or is it for some people and not for others? I went to my first class because I heard there would be lot of beautiful women in it. But once I was there, I immediately knew that yoga was going to be one of the most powerful influences on my life. I believe it’s for everyone—men, women, black, white, gay, or straight, it’s good for you. One of the definitions of yoga is “union with God,” and that’s obviously something we all need more of in our lives. Your practice of yoga and study of the Sutras and the Bhagavad Gita inform the message behind Super Rich. How so? Very deeply. Those are the handbooks that guide me through life, so I reference them often in Super Rich. In fact, I retell some of the Bhagavad Gita in my own voice in Super Rich, which might strike some people as a little funny, but my hope is by doing so I’ll also introduce it to a larger audience—particularly the concept that real happiness lies in letting go of the results and focusing on the process. A lot of guys these days are re-evaluating the meaning of success—how do you define success? To me, success is being happy in your seat. I know some will say, “that’s easy for the rich guy to say,” but the truth is that I know a lot—maybe even the majority—of rich guys who are not happy in their seats, who have all sorts of expensive seats, but are always uncomfortable. So ultimately it’s not a money thing, it’s about consciousness. You advise your readers that they shouldn’t chase money. Why, as you argue, is not chasing money a key to success? Everything that you chase in life will run away from you, and that includes money. In the book, I argue that if you really want to get paid, the key is to not chase money. To be content with the process and not the results. As I say, the people who come to work each day needling less are always the ones who end up getting more. What’s the biggest mistake you’ve ever made, what did you learn from it? I have a hard time answering that one because I don’t get caught up thinking about the past. Every so called “failure” I’ve ever had I consider a great teacher, so it’s hard for me to look at it as a mistake. Because even if I didn’t set out to do what I was aiming for in that moment, I still learned so much from the experience. Who taught you about manhood? Yogananda. Ghandi. Minster Farrakhan. My father. What three words describe your dad? What was the best advice your dad ever gave you? Put your head down and get to work. Who is the best man you know, and how does he earn that distinction? I don’t really know the Dalai Lama, but he’s a great inspiration to me. I also call the Minister Louis Farrakhan “my second father” because I know him well, I’ve heard his heart and know how beautiful his higher intention is. I understand that not everyone feels that way about him, but I hope that one day they’ll appreciate him the way I do. 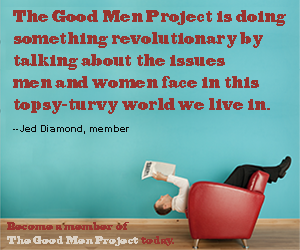 What advice would you give teenage boys trying to figure out what it means to be a good man? Be compassionate. That would be the first thing, because compassion is a tough concept for teenagers. A lot of teenagers feel very insecure, very hurt about their relationship with the world, but don’t know how to express it. And as I say, “hurt people hurt people.” I think if they could embrace the compassion that’s in their hearts, then through the connections they’d make they’d realize a lot of other people felt the same way as they did. What is the your most cherished ritual as a guy? My most cherished rituals don’t have much to do about being a guy. I don’t watch a ton of sports, for instance. Really, I just care about meditating every morning, practicing yoga in the afternoon, and watching Curb Your Enthusiasm when it’s on. As long as I have them, I’m good. Do you miss the golden age of hip-hop, circa 1994? I don’t miss it, per se, because I think the music is always evolving. But I do think there was some fantastic music made during that period and I’m glad I got to play a role in it. And artists like Q-Tip or De La Soul are still making great music almost 20 years later. What’s the best hip-hop album that came out in 2010, in your opinion? I don’t like to label something “the best.” I always say my favorite record is whatever’s hot on the radio right now. I like to live in the present. But I did really enjoy Kanye’s last one, and I thought some of the stuff Jay Electronica did was incredible, too.